A white gold ring with a brilliant is a stylish and classy choice for any woman, irrespective of her personal taste. Thanks to our extraordinary collaboration with renowned jewellery designers, you will undoubtedly be able to find the perfect white gold ring with a brilliant. Why not explore our extensive collection now. 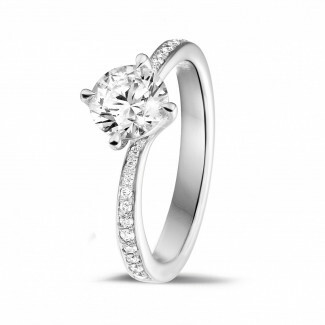 What should I pay attention to when buying my white gold ring with a brilliant? The brilliant cut appeals to the imagination with its unbelievable shine. The 57 perfectly cut facets reflect light like no other cut and will instantly make your ring unique. Irrespective of whether you opt for flowers with the Flowers collection, more abstract natural shapes with the Le Paradis collection, or one of the many other possibilities, you will undoubtedly be able to find your own type of elegance. Regardless of what your jewellery box looks like, a white gold ring with a brilliant will always fit in. Combine various different metals, or opt for monochrome, in line with your own preferences. Can I obtain advice when choosing my ring for her? You can rely on our professional diamond experts for solid advice both online and offline. 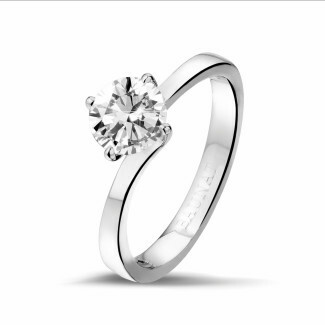 Contact us by phone, or via email or chat, or make an appointment in one of our specialised showrooms and personally see the white gold ring with a brilliant you have chosen before you order it. Can’t find exactly what you’re looking for in our extensive collection? 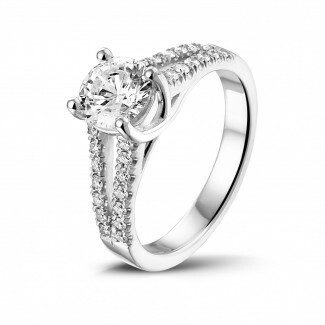 Then you can simply have your dream ring with a brilliant tailor-made. 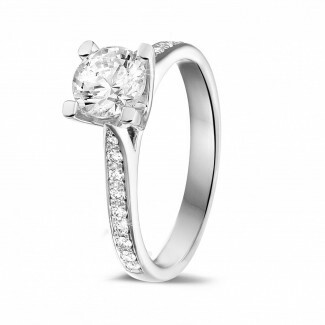 Can I buy my white gold ring with a brilliant online? You can see our white gold rings with a brilliant in the finest detail online, as well as all other jewellery. But your convenience isn’t the only advantage of our online collection. It also allows you to avoid expensive physical branches. 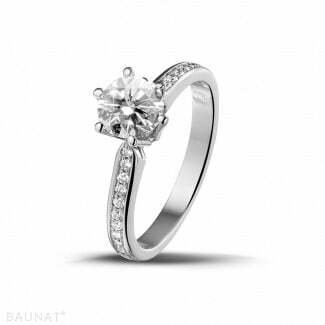 Combined with our purchasing process which skips many of the intermediary steps, you will be able to buy top quality jewellery from BAUNAT for 30 to 50% less compared to a classic physical jeweller. Plus all of our jewellery is subject to our 20 year product guarantee and a 30 day return period. This means you can always be sure you have chosen the right jewellery. Looking for the white gold ring with a brilliant of your dreams? Have you always wanted to receive such an exclusive gift from your loved one? Discover BAUNAT’s unique collection.